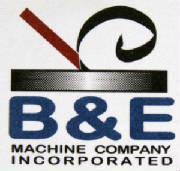 B&E Machine Company, has a knack with gearboxes. Reduction ratio gearboxes that have been worn out internally can have a new life again with the refurbishments we provide for our customers. A recent client brought us a reduction gearbox from a grain elevator system. 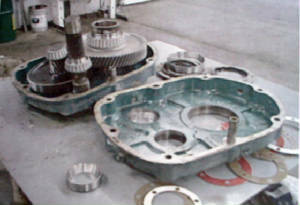 The internal bearings needed checking for replacement or refurbishment, the casing was beat and worn at attachment points and the gears needed to be checked for tolerances. 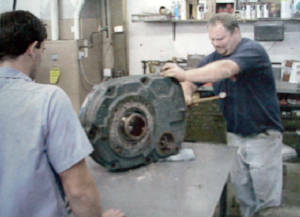 Arriving at our facility, the gearbox assembly was fork lifted into our gear repair section. The assembly was quickly unscrewed and disassembled by our special "Gearbox Team". Gears and bearings were checked for function, wear signs, and tolerance. Fortunately for the client, this gearbox had minimal wear. A thorough inspection found only wear on seals and minimal wear on bearings. 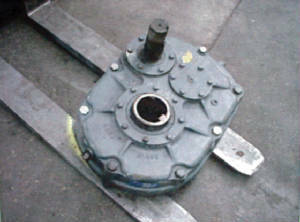 The appropriate seals and bearings were replaced, the unit reassembled and transported back to the client in 36 hours. Had the gearbox been more extensively worn out, we would have replaced, repaired, or refurbished all the operating parts and gotten it back to the client ready to be put into immediate service. B&E Machine Company, can "put the teeth" back in your operation by getting your worn gearboxes back in operation much faster than most OEM companies because we aren't constrained to minimum orders or lengthy time frames. The worn gearbox assembly arrives in our facility. The disassembled gearbox awaits inspections of gears, bearings and seals. Our special "Gearbox Team" goes into action to disassemble the assembly. 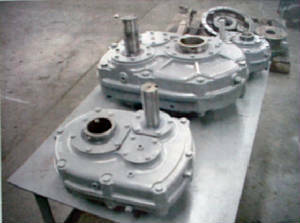 Refurbished gearboxes, with new paint coatings, awaiting transport back to the client.